but planning for Home Arts entries starts when the fair books arrive in the mail. We got ours last week. Unfortunately, the weather isn’t cooperating. My tomatoes this year are far behind schedule. The herbs were also decimated by the bunnies, so I am doing triage on the remaining stumps, and coaxing them to recover. So far, only the Box Car Willie plants have the potential to give me ripe heirloom tomatoes in time for the fair. Mortgage Lifter and Paul Robeson are lagging in their production. Pineapple tomatoes are late bloomers anyway, and this year they are far behind. And, the hillbillies are downright disappointing. Want to know about heirlooms? This is a good site to learn about the varieties. Want to know about the fair? Check out their web site. This year my husband gets the senior discount. I still buy the season pass for $20, as we go to the fair at least four or five days. Can’t miss the fun events, like tractor pull. Skid loader competition. Iron chef. The 4H auction. And, so much more. This year, too, being the beginning of the election season, candidates will be out in force. Put the fair on your calendar. It truly is a community event, and for 68 years it has been going strong. Me, I just want one of these for tomatoes. The blue ribbon. I got one last year for my herbs. I keep trying to grow great heirlooms, or cherry tomatoes, or this year, my foray into massive amounts of canning tomatoes. 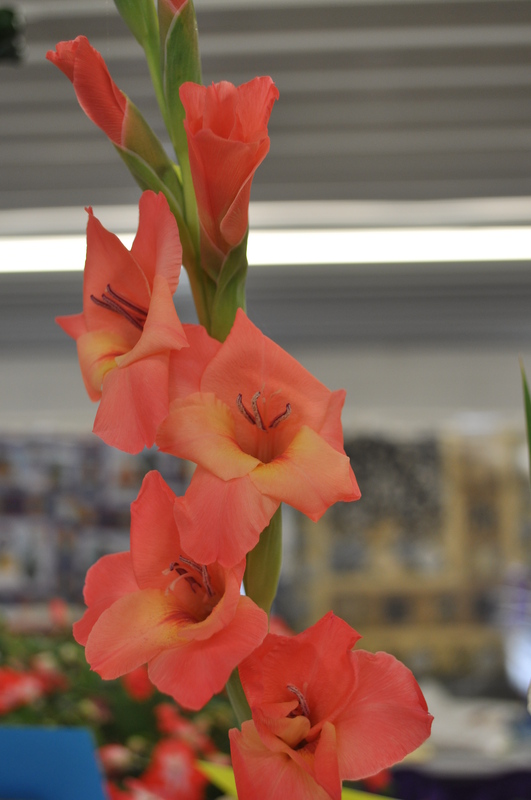 I also had success with the gladiolus. Crossing my fingers that they flower in time. 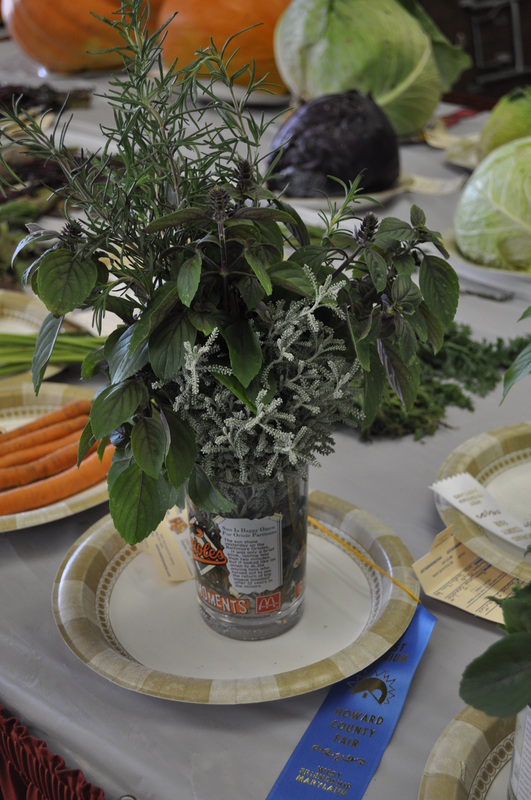 This one got a second place ribbon last year. I am thinking about photographs to enter. And, maybe some of my crape myrtle. And, my zucchini bread. It’s fun. Easy to do. Download the fair book and think of the possibilities. You still have four weeks to go. 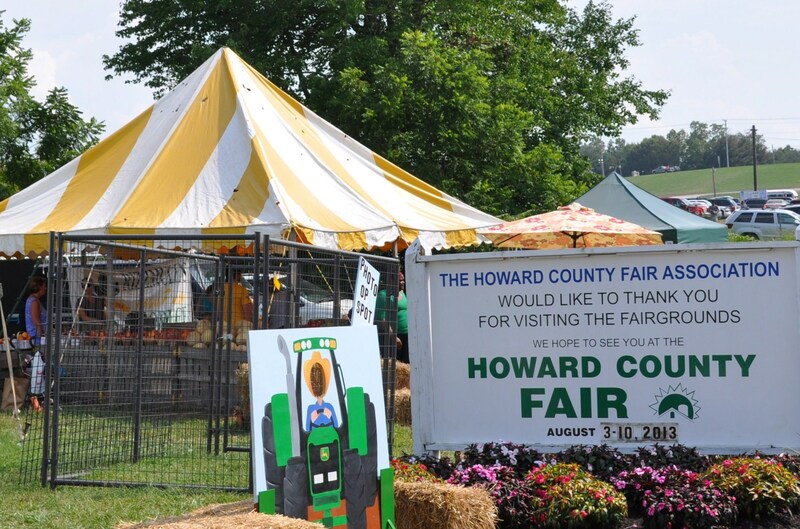 Posted in Community, Food, Gardening, Hobbies, Howard County, Nature, Real Food, Weather, West HoCo and tagged community, crock pot cooking, Food, gardening, heirloom tomatoes, hoco loco, Howard County, nature, photography, real food, tomatoes, weather. Bookmark the permalink.